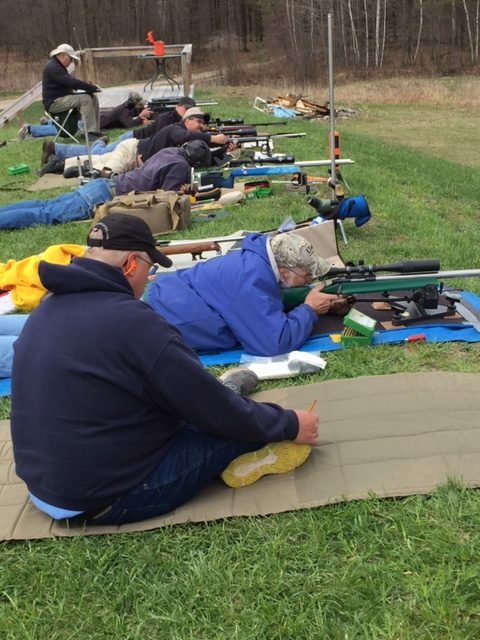 We had eleven (11) shooters arrive for the last of the Winter Mid-Range Prone matches for 2016. Due to really poor weather on the weekends that we would have liked to have run the matches in March and early April. We were not able to start until the 16th of April. In a typical year we get three (3) matches. This year, only by shooting the 16th, the 23rd, and the 30th of April were we able to complete three. However, for those matches we at least experienced reasonable weather, just a little chilly. This match was cut of the same mould. In the Target Rifle (Any rifle) category, Peter Church continued to demonstrate his sharp eye producing the first 200 of the year (200-14x) in the first stage, and finishing as the high Any Rifle with a 397-21X. Jake Bondy was a close second with a 397-18X. In the F-TR category, Ray Gross nailed a 396-18X, with John Roethlisberger (still using John Pierce's Rifle!) with a 393-15X. We found the importance of ensuring the batteries are charged as two of our targets stopped working during the match. We will be better prepared next week. Next Saturday will be the first of the Suburban Mid-Range Matches with a 3 x 600. Put it on your schedule!